As a reporter, sources were key to my success. In public relations, it’s all about networking. Either way, business cards are the lifeblood of communicators. 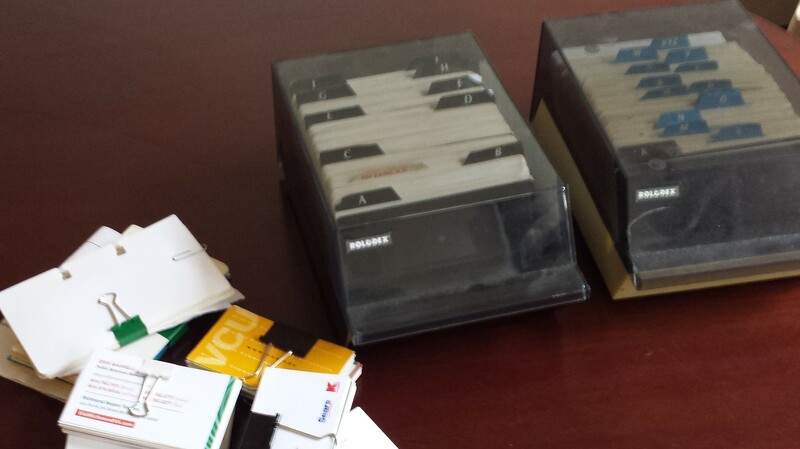 I miss the days of my big round Rolodex. I could spin it and find anyone at my fingertips. Yes, I know I can store and search for contacts using electronic contacts or LinkedIn. For me, though, there is a difference – I can no longer see the business card. Sometimes I forget the person’s name, but I can clearly recall the logo or image on the business card. One of my contacts has his image artfully drawn on it. I can forget his name, but I don’t forget the card. Or I’ll recall that you work at Ohio State University, but, again, I can’t remember your name. I spin the Rolodex and suddenly I see the Ohio State logo. I’ve found you. She calls herself a professional stalker, but in actuality she books interviews for Wolf Blitzer on CNN. When she files a person’s name and details, she puts a key word under the company name. That key word helps her remember what she needs to know about a person. If she has met a doctor who treated Ebola, she puts the word Ebola in the company name. When she searches for Ebola, the doctor’s name appears. She includes other critical details, including company name, in the notes section. I’ve totally embraced this idea. Everyone I met at a recent conference is now listed in my contacts under the same company name – that of the conference. Thanks for a genius idea Jill!